I have to write about this on my blog! Little Miss Overshare is so excited about every little thing that happens in her life that she's sure you'll want to hear about it, too. It doesn't matter if you are a long-suffering roommate, co-workers in a professional setting, or strangers asking directions, Little Miss Overshare will gladly and openly provide details of her life that no one wants to hear. Not that this slows her down at all! 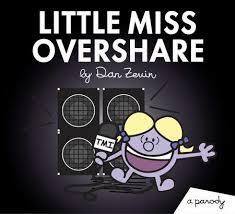 Little Miss Overshare is a parody in a series of books by the author Dan Zevin. Some other titles include Mr. Selfie and Mr. Humblebrag. While each small book no doubt reveals characters that we all encounter on a daily basis, for sheer self-absorption and cluelessness, it would be hard to top Little Miss Overshare. The book is very tiny, only about 5 inches square and 30 pages long. Each page of "oversharing" is accompanied by a drawing of an excited looking Little Miss Overshare along with pained looking recipients of her pronouncements. The book is cute and entertaining, and I'm sure it will call to mind people in our own lives who are fond of imparting TMI in social settings.